So compact and portable, you can bring the V-1HD and use it anywhere! 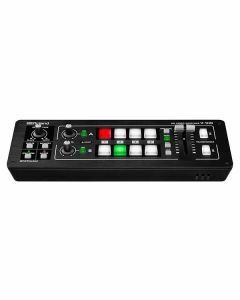 The V-1HD makes it easy to connect and switch video cameras, smart phones, computers, tablets, Blu-ray players and other HDMI video sources with a simple push of a button or slide of the T-Fader. It supports professional compositing effects such as picture-in-picture and keying allowing for graphic insets, titling or even “green screen” ideal for news broadcast or corporate training productions. Roland's V-1HD video switcher is a mobile solution for HD video production that houses up to four HD inputs. Each inputs enjoys a frame buffer so there’s no need to Genlock your input sources together. It’s possible to control the switcher manually by with integrated controls or electronically, after connecting it to a computer or iPad with the optional software installed. Set your working resolution and alternate between the four input sources. A 12-channel audio mixer sits within the switcher, capable of embedding and de-embedding audio signals from HDMI. The integrated T-fader permits manual control over the speed of transitions, or the take button can be used to actuate the selected transition. The unit delivers a program and multi-view preview output as well as an analogue audio input and output. Though compact in size, the V-1HD performs picture-in-picture, green-screen, and other keying effects. A transform control enables advanced video effects on your footage. This portable HD switcher supports four inputs of HD video. It allows selection of 1080i, 1080p, or 720p as your input source. You choose the broadcast system (59.94/50 Hz) in menu. The format selector switch is a global switch that applies to the input and output format. However, with the switch in either of the 1080 options, the V-1HD enables input of both 1080i and 1080p signals. 1080/50p(FORMAT switch = 1080i or 1080p) *The input interlaced video signal is converted to progressive video signal by internal processing. *The video signal frame rate is selected by SETUP parameters (59.94 or 50). HDMI: 1080/59.94p,1080/50p(FORMAT switch = 1080p) *The video signal frame rate is selected by SETUP parameters (59.94 or 50).